As requested by popular demand, Civ4 AI Survivor is back again for Season Four! That's not hyperbole from me either: I repeatedly received requests on my Livestream and even via private emails asking when the next season of Civ4 AI Survivor was going to return. In our small corner of the online Civilization sphere, there's real interest in following along with these matches. Back in Season One, I was still figuring out the format and running everything via forums posts at Realms Beyond. It was a bit of a rough process even if it was still fun. For Season Two, I switched over to Livestreaming the matches in real time, and that made things infinintely more fun for everyone with the viewers getting to comment on the action in real time. It's not an exaggeration to say that the running commentary on the Livestream was often much more entertaining than whatever the AI leaders happened to be doing at the moment. Season Three saw more refinements to the process, with maps selected ahead of time and blindly assigned to the leaders for purposes of fairness, and online straw polls/predictions recorded before the matches and included in a series of written previews. We had our largest turnout ever for Season Three, with 80-100 viewers consistently watching the games on Livestream and taking part in the picking contest. Can we get reddit/civ involved and beat those numbers for Season Four? Let's find out! The basic tournament structure will remain the same from past seasons. The 52 AI leaders in Civilization 4 get randomly sorted into eight opening round games, half of them with 6 leaders and half of them with 7 leaders. Two leaders will advance to the playoff round from each match, the winning leader and the non-winner with the highest in-game score. AIs who survive the match but do not advance will get one final opportunity to make the playoffs in a Wildcard game played after the opening round matches. The Wildcard game has had as many as a dozen leaders in past years and it can get a little bit weird as a result. This creates our field of 18 leaders sorted into three playoff games of 6 AIs apiece. Finally, we feed the top two leaders from each playoff game, the winner and the highest scoring non-winner, into a championship game and crown an overall winner of the competition. AI leader rankings are based on the "PowerRanking" scoring that I compiled at the end of Season Three; click here for a link to the full list. The idea here is to create some balance between stopping the top AI leaders from hitting one another in an opening round "group of death" match, while still preserving the random draw element that makes this event so much fun. Choosing to pick pools of leaders ranked 1-8 and 9-16 is of course an arbitrary decision, but it turned out that there were three different AI leaders tied in 17th place and selecting the top 16 leaders made for a natural cut-off point. Sorry Shaka, Hannibal, and De Gaulle, you just missed the cut. The game settings will continue over from the last Civ4 AI Survivor competition. We use Deity AIs to speed up the overall pace of the game and reach victory results sooner. The map script is the default Pangaea, designed to keep all of the AI leaders in close contact with one another. Prior to the Season Three competition, I went ahead and tested out some games with Continents or Archipelago setups, and they just didn't work that well. The Civ4 AI doesn't really know how to run naval invasions, and there were lots of wars that just did nothing because the AIs couldn't reach one another. They need to be on the same continent from what I've found, and Pangaea works well enough for that. We use Normal game speed and Standard sized maps, with the one exception of dropping the sea level to "Low" setting for the games with 7 AIs to create a little more room for the extra competitior. For the game options, the biggest effect on the gameplay is turning off Tech Trading. I'll repeat here what I wrote in the setup phase from past years: "When tech trading is left on, the AIs tend to stay bunched together with no one ever getting too far ahead or falling too far behind. With everyone fielding the same units, it becomes difficult for the AIs to attack one another successfully, and generally makes for less interesting games. But when tech trading gets switched off, all of the AIs have to sink or swim based on their own research efforts. This spreads them out much more widely on the tech tree, and once the laggards fall a full generation behind in military tech, they tend to get swallowed up by their more advanced rivals." With tech trading removed, we frequently see some AIs fall an entire era or more behind in technology, which prevents would-be conquerers from ignoring their economies and trading their way to tech parity. A balanced approach tends to work the best in these games, with alternating periods of warring to expand followed by peaceful consolidation. Woe to those who fall behind in military tech in this competition - it nearly always ends badly. Otherwise, we turn off Vassal States to prevent the AIs from surrendering to one another. If they can vassal when losing wars, hardly any of the AIs ever get eliminated, and that's boring. We want to see bloodthirsty games! No escape, no mercy. We also turn off Events because they're kind of a Single Player thing, and the AI doesn't understand what they do. I've debated turning off the goody huts (tribal villages) but they remain in the game for now. We also use Aggressive AI to spice things up and increase the number of wars. The big thing that Aggressive AI does is remove a flag that will stop the AIs from declaring certain wars. Normally they will not attack someone who has more than double their military power. Turning on Aggressive AI removes that check in their coding logic. This leads to occasionally suicidal war declarations based on diplomatic relations, and that's exactly the kind of thing we want to see! In addition to the creating two pools of protected high seed AI leaders as discussed above, there are a couple of other minor tweaks to the format for this season. First of all, we're changing up the climate setting once again, largely just for fun. The first three seasons of AI Survivor used "Temperate", "Arid", and "Tropical" climates for the games, and we'll go with "Rocky" for this season. Season Four of the actual Survivor television series took place in the Marquesas Islands, which are indeed quite mountainous in real life. This should have little impact on the map generation aside from creating a bit more in the way of hills and peaks. We'll also continue to use the "Choose Religions" options so that we can avoid getting Buddhism and Hinduism as the dominant religions in every game. The most significant change to AI Survivor for this season comes in the form of the starting techs. If you haven't played a lot of Deity difficulty in Civ4, you might not know that the AIs get four free starting techs: The Wheel, Agriculture, Hunting, and Archery. Since different civilizations start out with different technologies in Civ4, assigning additional free techs inherently favors some civs over other civs. For example, France has The Wheel and Agriculture as its starting techs, which means that leaders like Napoleon and De Gaulle get nothing extra. In contrast, India starts with Mining and Mysticism as its techs, so Gandhi actually begins the game with six technologies on Deity, two more than any of the French leaders. While this might seem like a small thing, it ends up providing a pretty sizable advantage in terms of getting the initial growth curve up and running. In our competitive Multiplayer games, China used to be a popular pick simply due to having the best starting tech pairing in the game (Mining + Agriculture). There's no reason to let this disparity continue to exist, and civs like France should stop being penalized for not having the "correct" starting technologies. Therefore we're going to restore everyone's proper starting technologies for Season Four. No more free Deity starting techs for anyone. (Since I'm text-editing the Worldbuilder save files anyway, this doesn't even require any extra work on my part in terms of game setup.) It's unclear exactly how this is going to affect the AI leaders since we've never done this before, but I think it's going to be significant. The tech pace should move slightly slower as a result, and warmongering AI civs who insist on researching Bronze Working before Agriculture are more likely to be shooting themselves in the foot. I'm fascinated to see how this is going to play out; thinking about each leader's starting techs and how they relate to the specific starting position of each game should be more important than ever. The other change that we're going to try for Season Four is having a second observer civ. There's always one observer civ run by the player, needed so that we can be present in the game and watch what's going on. Gandhi has traditionally played this role, sitting down at the bottom of the map in a mountain-locked ice wasteland at permanent Friendly relations (+100) with everyone else. The one problem with the observer civ is that we've never been able to see the voting that takes place in the Apostolic Palace, as adding the AP religion to the observer civ would unlock a potential religious diplomatic cheese victory, something that we want to rule out. This is where the suggestion of a second AI-controlled observer civ comes in: if we stick another AI into the game, we can add the AP religion to the player-controlled observer civ and then follow the Apostolic Palace resolutions in real time. The Apostolic Palace has often wrecked havoc on the diplomacy in these games, especially when it forces everyone else to declare war on some hapless punching bag opponent. If this works as we hope it will, everyone will get to watch the resolutions as they get voted on and that will add to the madness taking place. Games will be Livestreamed on my Twitch channel linked below, with most games starting at noon local time (east coast of North America) on Fridays. I will archive the recordings on Twitch and try to post them on YouTube in smaller chunks for those who have trouble accessing the Twitch videos. I'm also soliciting help in putting together the written reports on the games that took place, in the same fashion that we've done for the games from past seasons. Several members of the community have been helping me write those, and we have all of the past games covered by now. It will be a huge help if the community can take over the burden of doing the written reports and allow me to concentrate on streaming and administering the games. Anyone interested in volunteering to help out? The picking contest system will continue to use a Google Forms submission, which was a massive timesaver in Season Two and Three as compared to originally compiling forum posts. The current bracket will always be visible online, and I'll do my best to update it here on my website, on my Twitch page, on the Sullla Discord channel, and at Realms Beyond. We'll have a forum discussion thread there, of course, which I'll link on this page once the competition has started. 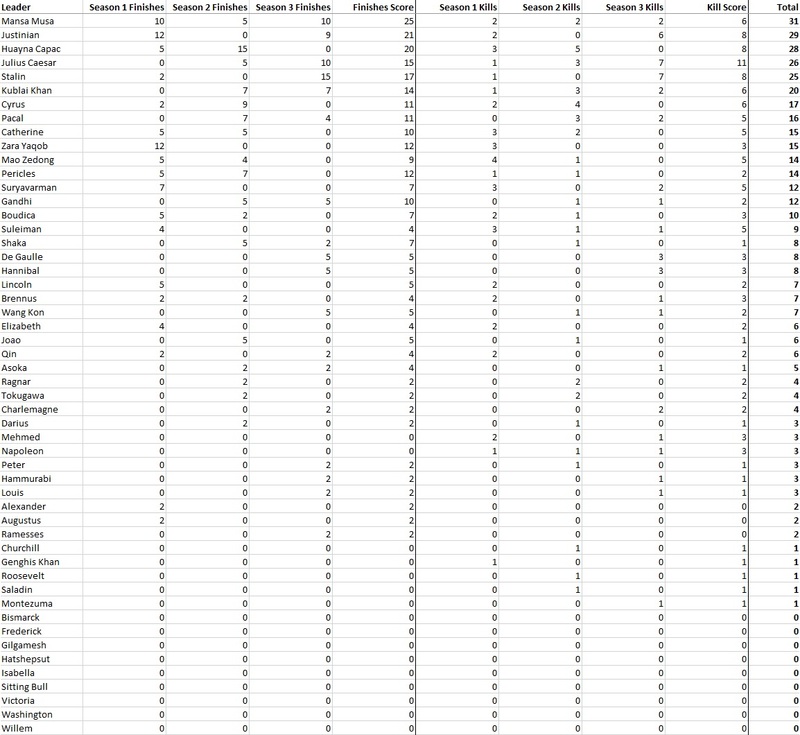 Scoring remains the same from past years, with points for first place, second place, first to die, victory date/type, and total number of wars. I went through the suggestions about different potential scoring goals after the last competition, and none of them felt like they would work as well as the current system. With points for the top two AI spots along with victory date and number of wars, we had scoring drama right up to the end of most every game, even when the winner had long since been determined. Check out the links below for more information on the scoring contest and how to submit your entries. With all that said, here's a big list of the relevant links that follows below. Enjoy the new season of AI Survivor!